Is it unusual that I break needles so often? 2 or 3 per month? Is this typical? Must be related to the type of sewing I'm doing, using thick threads and sewing through leather a lot. A few days ago, I had this particularly spectacular break resulting in a double fracture. One needle, three pieces. I use large-eye blunt #18 bookbinding needles as well as Crewel needles (maybe they are the same, I don't know). I'd be interested in hearing opinions on good needles! I bought some great needles at www.volcanoarts.biz I haven't had one break on me yet. I feel your pain. I've had ongoing problems with curved needles...once they've gone through a cover enough times, the eyes crack open. It happens with both bookbinding needles and sewing needles, so I just buy the cheaper ones now. Wow I feel kinda special now. I've never had a needle break on me and I just buy the cheap ones locally. I use the #18 sharp for my straight needle and whatever they sell for the curved needles are thinner but I've had no problems with them either. I do like the three piece split, If I'm gonna break a needle I hope it's that spectacular! You've gotten some great helpful suggestions on here so far. I'd recommend a 3 sided leather needle. I used these when I worked with leather, and found they cut through the leather like a hot knife through butter. I loved how easy they are to use. Good luck with whatever needles you decide on and I think saftey goggles may come in handy if you are going to break any more needles! That sounds scarey your 3 way break! What is a three sided leather needle? Can I buy them online as I'm in the UK? thanks for all the suggestions sue, billie, elissa, kiley, and ux! ux, i've never seen a 3-sided leather needle either. but i don't like pointy sharp needles, i poke myself a lot so i prefer the blunt ones. The 3 sided needle is easy to search online if you'd like to see a photo of one, just use Google Image search and you'll get an idea of one there. I see that it's also called a Glover's Needle. I used to buy from Tandy products and that was the needle I used when I made leather moccasins and boots. Hope this helps to define this needle better for you. It's a wonderful needle to work with on thick leathers. not sure if links work here. 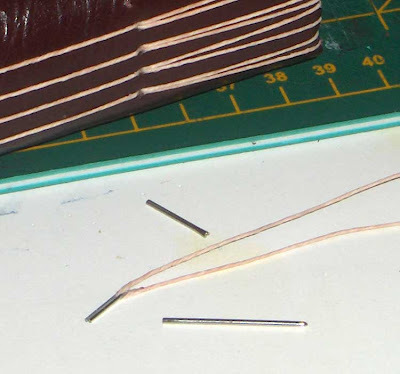 Yes, three-sided leather needles are best for leather work. As for the snapping into three parts - that is the Spaghetti Effect, so named by the late physicist Richard Fyneman, who never solved the problem, but according to the above article, a couple of other scientist have worked it out now. There must have been a bending force at the ends of the needle, I imagine, for it to brake in that way, like holding it close to the end, and pushing sideways on it just as it went into the leather. Just a little trivia, but shows what not to do if you value your eyes, unless you are happy to work with goggles.